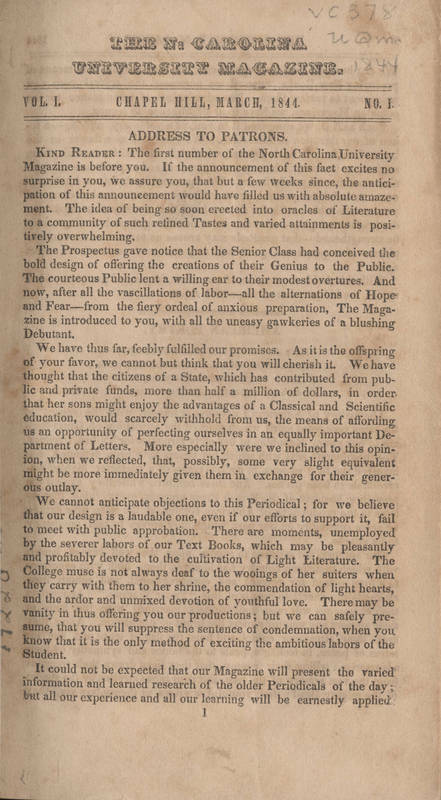 The senior class of 1844 sponsored the university’s first literary publication, the University Magazine, but it lasted only a year. In 1852, the Dialectic and Philanthropic Societies, the student debate organizations, took up the publication and added biographical and historical content to its pages. During the 1920s, students renamed it Carolina Magazine. Some of Carolina’s most distinguished writers appeared in its pages during the interwar period, including Thomas Wolfe, Paul Green, and Shelby Foote. In 1948, the magazine became the Carolina Quarterly and broadened its scope to include both student and non-student authors. For more on student publications, see the online exhibit, "Tar Heel Ink"